File photo of the Mount Everest base camp. RESECUERS ON EVEREST have found the body of a missing Indian climber, taking the toll from a deadly weekend on the world’s highest peak to four. Three other climbers died on Everest over the weekend, one of the deadliest episodes since an avalanche swept through base camp two years ago, killing 18. All the fatalities appear to be related to altitude sickness. “A search and rescue team have seen his body,” Thupden Sherpa of Arun Treks and Expeditions told AFP. Sherpa said that Kumar’s body was spotted about 200 metres (650 feet) from the main route and the team was assessing the feasibility of retrieving it. An American doctor Roland Yearwood and Slovak climber Vladimir Strba both perished yesterday above the 8,000 metre mark — an area known as the mountain’s “death zone” where the thin air heightens the risk of altitude sickness. The season has been marked by strong winds and unusually cold temperatures, the weather calmed over the weekend, opening a narrow window for climbers to make a bid for the top. Over a hundred climbers are expected to attempt to summit from Nepal’s south side today before the weather changes in the next few days and brings strong winds, according to forecasts. “Today there might be as many as 150 climbers reaching the top from the Nepal side, but it isn’t a record number,” Ang Tsering Sherpa, head of the Nepal Mountaineering Association, told AFP. Email “Rescuers find body of missing Everest climber, bringing death toll to four”. 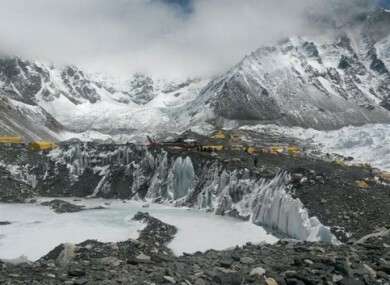 Feedback on “Rescuers find body of missing Everest climber, bringing death toll to four”.